Robin Hood claimed the second place spot in the Division with a 2 – 1 win over X-Road’s. The two teams who will battle it out on Sunday April 14th in the FA Challenge Cup Final were looking not to give too much away. The opening goal would come in the 15th minute when a Dominique Williams low drive from the edge of box beat the X-Road’s goalkeeper Dashun Cooper’s outstretched hand at the far post. In the 23rd minute Antwon Russell doubled the Robin Hood lead when he caught Cooper off his line from 40 yards with a dipping volley. X-Road’s would get on the board in the 87th minute, Jorge Sanchez scored from 30 yards after Robin Hood goalkeeper Dale Eve slipped in his box and couldn’t recover to save Sanchez’s chip. Neither team would beat the opposing goalkeeper for the remainder of the game as Robin Hood picked up the 2 – 1 win. The Flanagan’s Onions have secured at least a 5th place spot in the First Division after they defeated St. David’s 3 – 2 at the BAA Field. Daniel Lehner gave the Flanagan’s Onions the lead in the 3rd minute, Justin Pitcher would level the score at 1 – 1 when he found the back of the net in the 14th minute. 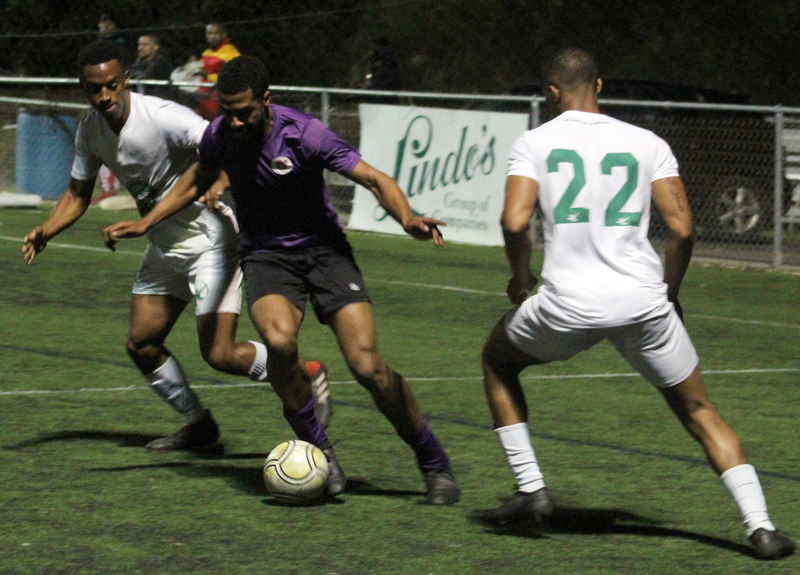 The third goa of the game came in the 60th minute when Mikale Williams gave the Flanagan’s Onions the 2 – 1 lead, eight minutes later Williams would make it a two goal game, but Kamali Davis would make it a one goal game when he scored for St. David’s in the 74th minute. With no further goals the Flanagan’s Onions would move ahead of the St. George’s Colts who have a game in hand.